The Philippines boasts over 7,000 islands, of which Coron is the one blessed with a concentration of wrecks to rank it as one of the finest wreck diving locations in the world. The wrecks are there as a result of an air attack by fighters and bombers, from a distant US Navy aircraft carrier, back on September 24th 1944. There was a fleet of 24 Japanese supply ships at anchor around Coron and you can read a detailed historical account via this link. It makes interesting reading and augments the enjoyment when you are in the water. 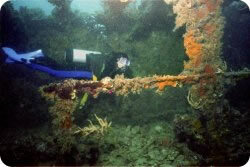 Some of the wrecks are huge, up to 160 metres in length. All the big wrecks are either upright or on their sides, none are upside down. Despite being salvaged by the US Navy back in the early 1960's all the wrecks are remarkably intact structurally and some stunning penetrations and swim throughs are possible. Some wrecks have huge blast holes, allowing masses of natural light to penetrate deep into the wrecks, making for a magical experience for the novice wrecker! The outside of the wrecks have, after sixty years in the water, become some of the finest artificial reefs to be found and are laden with both hard and soft corals and an abundance of fish life. The decks of the wrecks are in depths ranging from 10 to 30 metres and the seabed at the deepest wreck, the Irako, is only 43 metres. 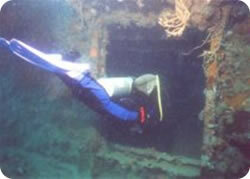 This makes these wrecks accessible to a wide variety of divers. Everybody can enjoy these wrecks, from Open Water Divers right through to experienced wreckers. The Coron wrecks are one of the best kept diving secrets in the World and, as a result, you will be unlucky to find another dive boat at any of the wrecks you visit. You usually have the wreck to yourselves! 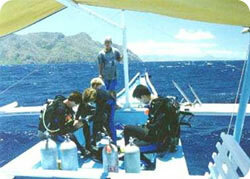 Wreck diving in Coron is a full day trip for two or three wreck dives. 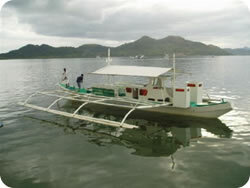 You will be aboard a 'banka', traditional outrigger style dive boat, all day and the normal departure time is 09:00am. You can choose to dive with a buddy or be guided. You determine your NDL and watch your air supply. We don't limit the time of your dives. There is a recompression chamber in Coron but we have no wish to use it. We are very careful with our dive profiles and dive planning to avoid decompression sickness problems. 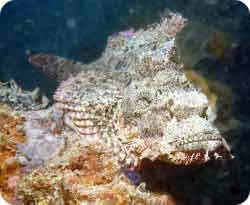 The 'Look Sea' diving banka, available for charter complete with experienced crew. Contact us for details!